In recent times, we’ve heard endlessly from The Treasury and the government about the emphasis they want to place on the “living standards framework” Treasury has been cooking up for some years for a left-wing government (the previous government had little interest). We are constantly told that there should be less emphasis on GDP-based measures. Prime Minister Jacinda Ardern was enthusiastic about the new approach in her speech in a church on Wednesday about the Government’s plans beyond the first 100 days. From 2019, Budgets would be delivered using new metrics designed to paint a more accurate picture of New Zealanders’ lives and encourage government to tailor spending to lift the country’s performance across those metrics, she announced. Budgets would go beyond GDP per capita and debt to GDP ratios to analyse the wider effects on people’s wellbeing and the state of the environment in an inter-generational way, she said. “By Budget 2019 Grant and I want New Zealand to be the first country to assess bids for budget spending against new measures that determine, not just how our spending will impact on GDP, but also on our natural, social, human, and possibly cultural capital too,” she told the crowd. I’m among those who’ve long been sceptical of the Living Standards Framework, and the “four capitals” approach that is now its shop window. It has always seemed content-light, and more about product differentiation (on the one hand), and a way of avoiding focusing on the decades-long record of productivity growth underperformance (on the other). Treasury has had no compelling answers to the productivity failure, and so it must have been tempting to shift the focus. Since the new government evidently has no plan, and they have “feel-good” constituencies to please, it must have seem doubly appealing. I’ve been meaning to write some more about some of the papers and speeches The Treasury has released recently, expecting to cast further doubt on whether the new framework is likely to add any analytic value, or improve the quality of policymaking. For years, economists have worked to develop a way of measuring general well-being and comparing it across countries. The main metric has been differences in income or gross domestic product per person. But economists have long known that GDP is an imperfect measure of well-being, counting just the value of goods and services bought and sold in markets. The challenge is to account for non-market factors such as the value of leisure, health, and home production, such as cleaning, cooking and childcare, as well as the negative byproducts of economic activity, such as pollution and inequality. Charles Jones and Peter Klenow proposed a new index two years ago (American Economic Review, 2016) that combines data on consumption with three non-market factors—leisure, excessive inequality, and mortality—in an economically consistent way to calculate expected lifetime economic benefits across countries. In our recent working paper, Welfare vs. Income Convergence and Environmental Externalities, we updated and extended this work, attempting to include measures of environmental effects and sustainability. In this blog we look at our results from updating the new index. Our findings clearly suggest that per capita income or GDP does capture the main component of well-being. And health—a key component of well being—is critical to raising welfare and income. There is a close relationship between our calculation of per capita welfare for 151 countries in 2014 and per capita income or GDP. 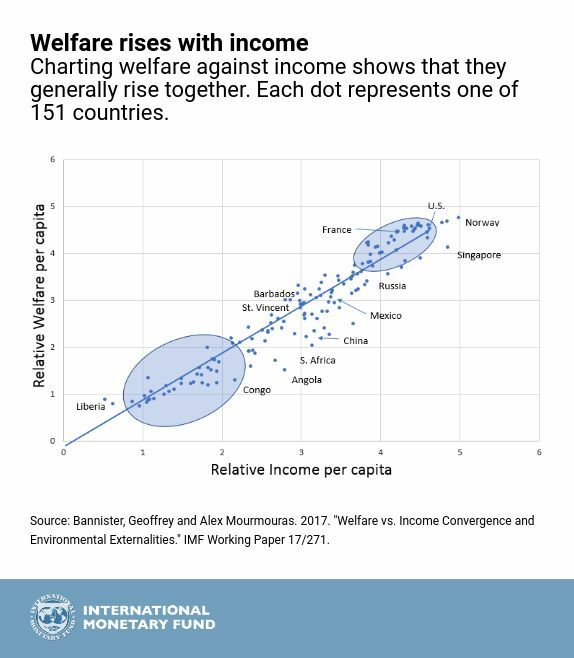 The chart above [reproduced in the tweet] shows that most countries line up fairly well along the 45-degree line (where relative welfare and income per capita are the same) indicating correlation, but there are significant differences, too. Poorer countries on the left are largely below the line, showing that welfare is lower than income. Richer countries at the top right are above the line, reflecting welfare that is higher than income. Enough said really. There is little sign of any obvious gain from shifting the focus of the Budget, or The Treasury’s advice from GDP per capita, and the productivity measures – GDP per hour worked, and MFP – which are associated with them – to amorphous living standards/ “four capitals” measures. Of course GDP isn’t perfect. And of course governments can boost GDP is welfare-detracting ways (eg conscription and forced labour), and yet The Treasury ends up promoting new research from the IMF suggesting that in fact countries don’t do so to any material extent (if it were otherwise more countries would be much further from the 45 degree line). It suggests what everyone has always known – that in setting policy governments do think about other stuff, not just GDP (check out all those Cabinet papers with “Treaty implications” section, as just one example). And that measures that free people and economies to lift productivity, and with it potential GDP, remain the most salient and reliable way to lift key elements of living standards (not just material consumption). Fix productivity and many other possibilities comes with it. It still won’t capture everything, but beyond that a great deal involves explicit value judgements, in which area Treasury has no superior expertise or insight. Perhaps instead of diverting so much of their analytical resource into the new-fangled, not particularly robust, tools and frameworks, The Treasury could return to getting the basics right: robust advice on expenditure, calling out bad or rushed policy when it is proposed/promised, and focusing in – with a genuinely open mind – on the specifics of why New Zealand’s long-term productivity performance has been so poor.